The serene White Room… a twin room with en suite shower, which overlooks the garden and vineyard and catches the glorious morning sun. 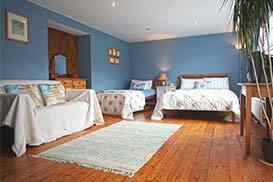 The beautiful Blue Room bed & breakfast accommodation, an en-suite family room designed to sleep up to 4 people. Lobhill Farmhouse, bed & breakfast and self catering accommodation, offering beautiful gardens, woodland and views of Dartmoor. The Stable self catering accommodation is a beautifully renovated stone building just three miles from glorious Dartmoor. We have four bed & breakfast rooms in the farmhouse. Pictured here is the calming Green Room. Breakfast is served in the large farmhouse kitchen with a choice of an Aga cooked full English breakfast or a lighter option. The Lobhill estate bed and breakfast boasts stunning views of Dartmoor, Alder Vineyard and local farmland. Dartmoor is just 3 miles away. Lobhill Farmhouse offers the highest quality Devon bed and breakfast and self catering holiday cottage accommodation near Okehampton, Tavistock and Dartmoor. In the heart of the West Devon countryside, our AA 4 Star Silver award winning four B&B rooms are spacious, en-suite, highly specified and spotless! 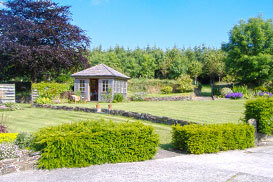 Lobhill Estate is 3 miles from Dartmoor and very close to Okehampton, Tavistock and Launceston. I genuinely enjoy looking after my guests and many return, time and time again. I look forward to meeting you and your fellow guests and please remember, my rooms and self catering holiday cottage are excellent value! 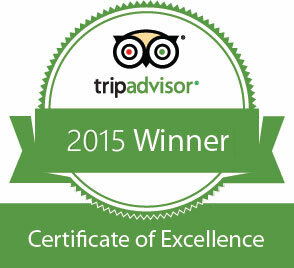 Jane x.
TripAdvisor Certificates of Excellence for 2014 and 2015. 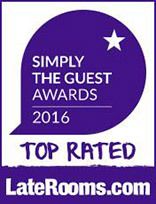 The Certificate of Excellence is awarded to bed and breakfast accommodation providers who consistently earn outstanding feedback from TripAdvisor travellers. It is regarded as highly prestigious and is based on “real” and “honest” opinions by guests. Our team gave themselves a small but humble pat on their collectives backs for this. Please read our reviews on TripAdvisor by clicking here or on this website by clicking here. AA 4 Star Silver Award for 2018. Lobhill Farmhouse Devon Bed and Breakfast have received this Silver AA 4 Star Award for three years running now as well as previous “standard” 4 Star awards for many years. It just goes to show that hard work, attention to detail, cleanliness and warm hospitality are the minimum standard. Of course, it is my guests that benefit from this, enjoying their stay in my beautiful country farmhouse accommodation. Please click here to view other awards and accolades (of which I am very proud). Call direct on 01566 783542 and quote “Autumn Break 2018”. Valid through November 2018 and December 2018 excluding Christmas 24th, 25th, 26th December at my Luxury Devon B&B. Please see the tripadvisor reviews for genuine testimonials. Ever wanted to walk the Two Castles Trail but felt it was too far in one day? Fancy doing it over two days with dinner and B&B on each evening? If you’re a keen walker but find 20+ mile routes a little too much, this could be your ideal holiday break. 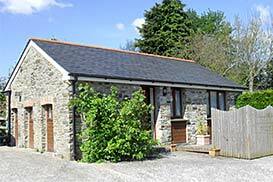 Holiday Cottage to let near Okehampton, Launceston, Tavistock and Dartmoor. Did you know that I have a beautiful self catering centrally heated Devon holiday cottage at Lobhill Farmhouse Estate? It’s perfectly situated for walking on Dartmoor, catching up with friends and family, visiting local towns and cities like Okehampton, Tavistock, Launceston, Plymouth and Exeter, attending a wedding in Devon or just a lovely holiday in stunning Devon. Year round the holiday cottage is warm and comfortable with excellent facilities. And the price, YES, it’s amazing value. Why not visit in the autumn or winter and take advantage of Devon’s beauty. Find out more by clicking here and plan the perfect base for your perfect holiday. A family run luxury bed and breakfast in Devon near to Okehampton, Launceston, Tavistock and Dartmoor, Lobhill Farmhouse offers a warm welcome, quality farmhouse accommodation and a relaxed and peaceful stay in a stunning location. There are 4 rooms, White, Yellow, Green and the largest, Blue, all with en-suite bathrooms. Breakfast is served in the large farmhouse kitchen with a choice of an Aga cooked full English breakfast or a lighter option. All ingredients are locally sourced with the eggs being laid just metres away by the hens in the family run vineyard. The beautifully renovated, Devon holiday cottage self catering accommodation enjoys the enviable position of being just 3 miles from glorious Dartmoor and still within easy reach of the coast. Ideally situated to explore both Devon and Cornwall, the stable is a perfect retreat for keen walkers and nature lovers. Accommodation is for two people with a large double/twin bedroom with en-suite bathroom and separate toilet room. Facilities comprise a well equipped kitchen, electric cooker, microwave, fridge/freezer, washer/dryer, a large living area for dining and relaxing with TV, DVD player and radio/CD player. The Lobhill Farmhouse estate offers beautiful gardens, two enchanting summer houses, walks through woodland, a serene pond and amazing flora and fauna. Further afield there are views of the family’s vineyard, Alder lakeside and Dartmoor. The estate is a perfect base for walking, coastal paths, West Country exploration, the Tarka Trail and cycling holidays. 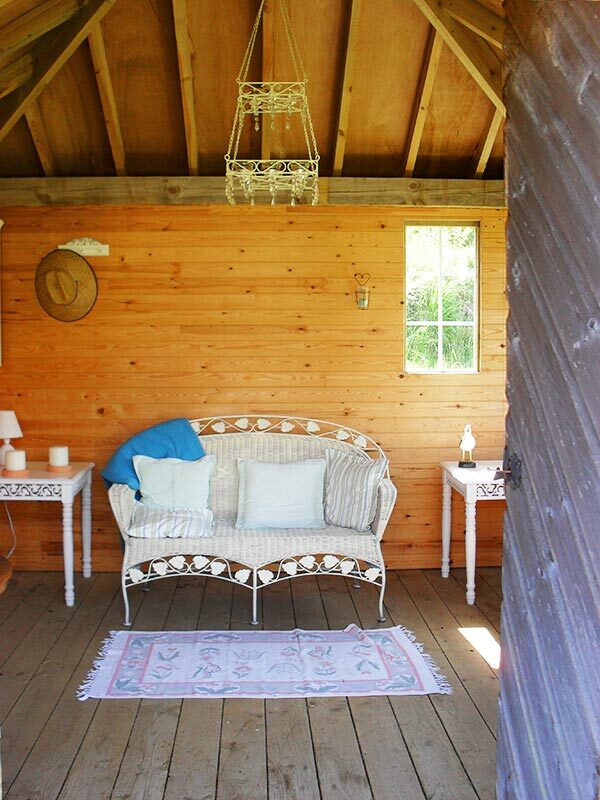 Many guests enjoy a relaxing read in the summer house or spend time exploring the woodland after a busy day's sightseeing.